One of the most interesting aspects of Gorbachev’s plan to restructure the Communist system in Perestroika was the re-introduction of workers’ control. Lenin briefly introduced this after the Bolshevik coup of 1917, but it was reversed when it was found that, contrary to Bolshevik expectations and dogma, the workers couldn’t manage industry on their own. Lenin himself was fiercely autocratic and intolerant, and the Bolshevik monopolization of power offended not only liberal democrats, but also other committed Marists, like Karl Kautsky and Rosa Luxemburg, who wrote articles denouncing it. Much of the intolerance and oppressive nature of the Soviet system came directly from Lenin and his doctrine of ‘democratic centralism’. This was the dogma that once the leaders of the Communist party had made a decision, no further discussion was permissible, and their commands should be carried out with any further debate or protest. Nevertheless, Gorbachev harkened back to Lenin and his supposed espousal of democracy in order to invigorate the moribund and sclerotic Soviet system. The reintroduction of workers’ control was part Gorby’s wider programme of democratizing Soviet society. We are taking a new view of the correlation between one-man management and the participation of work collectives in handling production tasks. this is a topical issue. There will be no progress without workers’ involvement in management through the corresponding mechanisms – at the work team, factory shop, plant and integrated works level. Furthermore, a work collective must have the right to elect its manager. And the latter receives the right to one-man rule on behalf of the collective, uniting everybody by his willpower. Elections of economic managers are direct democracy in action. Initially people were frightened by this, claiming that we had gone too far, that things could come to a bad end. But those who reason that way forget the main point, that common sense always prevails. Group interests, a practice of covering up for one another, will somewhere make themselves felt. But basically everyone wants his work team, factory shop, enterprise, collective or state farm to be headed by dependable, intelligent managers capable of leadership, of opening up vistas for improving production and life. Our people understand this, and they certainly do not need weak management. They need people who are talented, considerate, yet demanding in a fair way. People want to see changed attitudes on the part of the plant manager, shop superintendent and foreman. People expect a moral example and they expect it particularly from their superiors. There are several such examples. Where there is a good manager, there is success. He takes care of people. Everyone wants to talk with him. He need not raise his voice in giving out orders. He may look quite ordinary, but he sees and can explain everything. It is now extremely important to be able to explain the situation. People will agree to wait if they see why some of their demands cannot be satisfied fully right away. (Pp. 103-4). What our country is undertaking and the issues it is tackling implies a re-evaluation of the role of trade unions in social affairs. It should be said first and foremost that our unions are a formidable force. No labour law can be drafted unless endorsed by the All-Union Central Council of Trade Unions. On all questions concerning labour laws, their enforcement and the safeguarding of the working people’s right the trade unions have the final say. If a manager fires a worker without asking the union for approval, a court of law automatically makes the decision invalid without any deliberation, inasmuch as the trade union has not been consulted for its opinion. No economic development plan, for one year or five years, is submitted to the Supreme Soviet unless approved by the trade unions. When the plans are in the making, the trade unions participate as well at all levels. Social insurance, the running of sanatoriums and recreation resorts, tourism, physical training and sports, and the rest and recreation of children are all the responsibility of the trade unions. Consequently, they wield real power. But, all, over the past few years there has been less trade union activity. On some issues, they have yielded their prerogatives to economic managers, while not enjoying some rights effectively enough. So, having set about restructuring, we saw that the work of the trade unions could not be termed satisfactory. During my trip to the Kuban region, I reproached trade union leaders for pandering to managers, sometimes going so far as dancing to their tune. I asked them whether it was not high time they took a position of principle, and stood up for working people? The new role of the trade unions in conditions of perestroika should consist primarily of giving a stronger social orientation to economic decisions, offsetting technocratic encroachments which have become widespread in the economy in the last few years. this means that the trade unions should be more active in elaborating the social sections of economic plans, and, if need be, setting forth and upholding their own alternative proposals. Trade union committees should have teeth, and not be convenient partners for management. Bad working conditions at some enterprises, a poor health service, substandard locker rooms- trade union organisations have got used to all this. but Soviet trade unions have the right to monitor managerial compliance with labour contracts, the right to criticise management, and even the right to demand that director who fails to comply with the legitimate interests of the working people be removed from office. It would be wrong to think that under socialism the working people do not need any protection. They should be protected even more, for socialism is a system for the working people. Hence the tremendous responsibility of the trade unions. All Soviet society is vitally interested in more vigorous work being undertaken by the trade unions. (Pp. 113-4). All this was discarded during Yeltsin’s administration, when the economy was privatised and the voucher system introduced, which transformed the co-operatives Gorby had been setting up into bog standard capitalist enterprises. If Gorbachev had been successful, he would have created a democratic Socialist state, very close to the vision of the ownership of the means of production by the workers themselves that motivated Socialists as far back as the Owenite John Francis Bray in the 19th century. While not demanding the abolition of capitalism, Ha-Joon Chang states in his book, 23 Things They Don’t Tell You About Capitalism, that in countries where there is state interest in industry, or workers’ representatives on the boardroom, firms actually do better than when left simply to managers and shareholders. But unfortunately, that it what we are left with after thirty years of Thatcherism. And its continuing and accelerating under Cameron. We need a change. British trade unionism needs to be revitalised, and we do need workers’ representatives in our boardrooms. As for Thatcher, her ideas were always bankrupt. They should have been thrown out before she ever took office. I looked up this article in the New Eastern Outlook thanks to Harry, one of the commenter’s on Mike’s blog. Mike reported that Britain has bombed a Syrian army base, apparently in response to a criticism about us by Assad. See the article ‘Cameron Orders Attack on Syrian Army, Retaliation for Assad Statements | Veterans Today‘ at http://voxpoliticalonline.com/2015/12/08/cameron-orders-attack-on-syrian-army-retaliation-for-assad-statements-veterans-today/. On the NEO site (New Eastern Outlook) today is a very good analysis by William Engdahl. He concludes that ISIS, once the “religious cover” is stripped away, functions as the Saudi Army. This is a self evident truth, but there is more. The United States of America has only managed to fund its grotesque list of wars and 700+ bases encircling Russia, China, and Iran by enjoying the privilage of the Petrodollar (that unique arrangement between the USA and KSA). The US’s determination to bring Russia back to heel following the western looting post Yeltsin, has forced Russia to turn to China. Now the BRICS, Eurasion Union, SCO, New silk Road etc are reducing drastically the need to hold dollars for trade by instituting a parallell banking system using Yuan (renminbi) and The Ruble as well as other BRICS currencies. If the Saudis were to be successful in grabbing Iraq and Syrias oil then the new qatari pipeline connecting to the Nabuccoi would isolate Russia and reinforce the Petrodollar and US hegemony. The stakes couldn’t be higher. Which is why WW4 is entirely possible and perhaps likely unless the peoples of the west act to stop this lunacy. The article traces the emergence of modern Islamist terrorism, from the CIA’s arrangement for the transferral of the banned Muslim Brotherhood from Egypt to Saudi Arabia, in order to create a powerful right-wing Islamic movement that could be used against Soviet attempts to gain power in the region. It also describes how the current Saudi King, Salman, and the intelligence minister, Prince Turki al-Faisal, as well as the Muslim World League, financed and set up Osama bin Laden and what became al-Qaeda in the 1970s through a network of conservative Islamic charities. The Saudis were also responsible for funding and aiding al-Qaeda fighters in the Bosnian conflict in the 1990s. The article also alleges that the shooting down of the Russian plane by Erdogan’s regime in Turkey was due to a deal Erdogan had made with the Saudis to allow al-Qaeda/ ISIS training camps in Turkey. The article concludes that ISIS is now effectively a religious disguise for a Saudi military campaign to control the area’s oilfields. This all sounds exactly right to me. I’ve read papers published from one of the American anti-terrorism think tanks that made it clear that Prince Turki al-Faisal, the Saudi intelligence minister, was indeed behind al-Qaeda operations in Syria and Iraq. Greg Palast in his book, Armed Madhouse, also reveals that one of the reasons for the allied invasion of Iraq was the Saudi desire to get their mitts on the Iraqi oil reserves, which are the largest after those of Saudi Arabia itself. And there’s a very interesting article in Lobster that states that al-Qaeda’s massacre of the Shi’a in Iraq was on behalf of the Saudis. It was not ordered by Osama bin Laden. This raises some very awkward questions about the type of war Cameron wants to drag us into. We are entering a hall of mirrors here, where the truth is the exact opposite of what we’re being told. Cameron, and before him Bliar and Bush have told us we’re fighting a ‘war on terror’, but so far we seem to be fighting to benefit the chief financiers of that terror, Saudi Arabia. I think this is one area where the Islamaphobes might actually be right. There was a comment by a former serviceman on one of the anti-Islam sites that said that the Saudis boast about having the Americans wrapped round their little finger, and that they’ll go and fight anyone the Saudis send them against. Unfortunately, I can see this as being true. It does not, however, mean that anything else the Islamophobes say is. In which case, it’s time to break this poisonous relationship. We are not the Saudis’ army, and we will not help them murder the other peoples of the Middle East, Muslim and non-Muslim, for their own profit. The Islamic modernist, Mohammed Abduh, was impressed with what he believed was the democratic nature of early Islam. He lauded the British Empire as the greatest force for Islam, because it was bringing democracy to the world. The Saudis are the complete opposite – a repressive, absolute monarchy. It’s time to revive and stress that democracy against their lies and terror. Mike over at Vox Political has the story, given by Vince Hessey, a member of the board of Birkenhead YMCA, of a man crushed to death by a refuse lorry. This poor soul was starving, having been sanctioned for 17 weeks. He was killed when the lorry picked him up when he was scavenging in a bin for food. Mike’s article goes further to critique the latest suggestion for combating starvation, Feeding Britain. This is a national organisation of food banks. This seems similar to the suggestion made by the archbishop of Canterbury, Justin Welby, which was bitterly attacked by Johnny Void a few days ago. It has its own dangers, quite apart from the government’s own absolute indifference to the suffering of the unemployed and desperate. The article’s entitled Benefit deaths: Man was crushed to death by refuse lorry while scavenging in bins, and is at http://voxpoliticalonline.com/2014/12/16/benefit-deaths-man-was-crushed-to-death-by-refuse-lorry-while-scavenging-in-bins/. Go and read it. Mike illustrates the article with a photo of a man in Chelyabinsk, Russia, looking for food in a bin. Even before the collapse of Communism, Russia had a serious homelessness problem. The Soviet homeless were dubbed bomzhi, meaning ‘people without abode’. Many of the Moscow homeless lived rough in the town rubbish dump. The Soviet authorities were so concerned with the homelessness problem that, at least in some republics, the rigid clampdown on private initiative was waived to allow people to build their own homes. The situation didn’t get any better with Yeltsin and the introduction of capitalism, either. 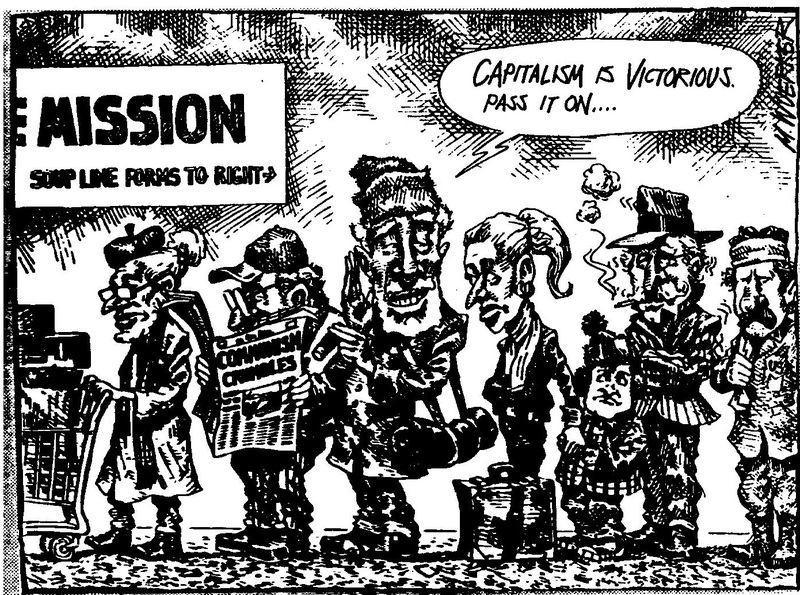 Yeltsin mass privatisation of Soviet industry saw the economy go into meltdown and millions thrown out of work. Rampant inflation saw the value of Soviet citizens’ savings and pensions wiped out. As the Soviet system provided work for everyone, except those blacklisted as dissidents, there was no welfare safety net. As a result, thousands were faced starvation or were thrown onto the streets. This was the new global economy created by the introduction of capitalism. And it’s not too different from here, where the Tories devastated British industry by selling it off en masse and destroying the welfare state for their own profit. So we’re back once again to Marx: ‘Workingmen of all countries, unite! You have nothing to lose but your chains’. I found this cartoon from a 1991 edition of the American radical/Left magazine, Z, in issue 21 of the parapolitics magazine, Lobster. I think it’s intended as a comment on the horrific poverty many Russians experienced during the economic meltdown following the fall of Communism under Yeltsin. Then everything was privatised, and millions laid off in an attempt to modernise and restructure Russian industry without the state putting into place any kind of welfare safety net for those affected. The economy more or less collapsed, and there were stories of Russian factories paying their workers in kind as the whole financial system broke down. It’s also a grim comment on the wonderful, capitalist society in which Cameron and his cronies wish to usher. Communism was a dystopian system in which people were deprived of their political rights, and worked in a decaying, inefficient economy where only the privileged political class had access to quality goods and services. And the difference with Cameron’s vision of a fully privatised, Conservative Britain is ..?